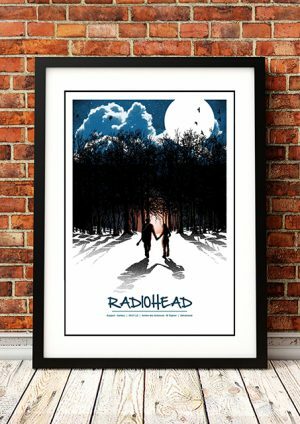 Classic Radiohead Band Concert Posters and Memorabilia! Buy Online Now! The latter group gave the band its name — it’s an album track on 1986’s True Stories — but Radiohead never sounded much like the Heads, nor did they take much from Bowie apart from their willingness to experiment. Instead, they spliced Floyd‘s spaciness with U2‘s messianic arena-rock heft, bridging the gap with guitar skronk borrowed from the ’80s American underground. Jonny Greenwood‘s jagged, brutal interjections on “Creep,” the band’s 1993 breakthrough hit, recalled the ugly noise of the Pixies and Nirvana, a sound that translated over the expanse of an ocean, but in the throes of the alternative rock explosion of the mid-’90s, Radiohead were the odd band out. America remained besotted with their homegrown sensations, so “Creep” was treated as a one-hit wonder, and at home in England, they were seen as dour art-rock students lacking the glamour of neo-glam sensations Suede, and deliberately dodging the beery singalongs of Oasis. 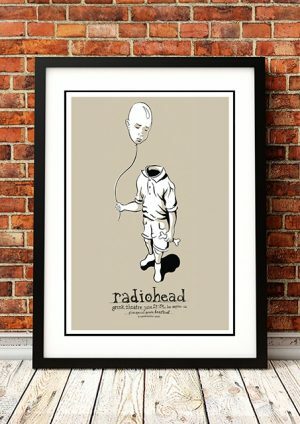 We stock some awesome Radiohead Band Concert Posters.